Bees and other pollinators are the backbone of our food system — essential for nutritious crops such as apples, almonds and blueberries. The portion of our food supply dependent on pollinators has grown by 300 percent in the last 50 years and $577 billion of annual global food production relies on direct contributions by pollinators. 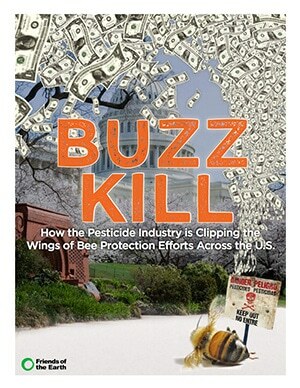 However, pollinators are dying at an alarming and unsustainable rate. The U.S. has been losing an average of at least 30-40 percent of its honeybee colonies annually, and 40 percent of invertebrate pollinator species, including bees and butterflies, are on the brink of extinction worldwide. A growing body of science shows that pesticides are a leading driver of pollinator decline. Neonicotinoids — the most widely used type of insecticide in the world — are particularly toxic to bees, and glyphosate, the most widely used herbicide in the world, has been identified as a major source of monarch decline. Neonicotinoid use has skyrocketed in recent years from zero pounds in 1994 to over 6 million pounds in 2012, while glyphosate use jumped from 17 million pounds in 1992 to 286 million pounds in 2012. Neonicotinoids now comprise 40 percent of global insecticide sales and generated more than $2.63 billion in sales in 2011 alone), while glyphosate represents a roughly $8 billion yearly market.